At QIS, custom is the keyword. Each of our clients has unique needs, and so it's only fitting that we offer each a unique solution. Customarily, though, our services can be broken down into four categories. Click on the category that interests you to learn more. What QIS does best: state-of-the-art equipment for seamless integration with your industry. 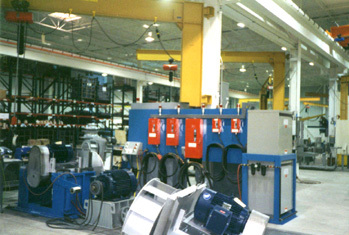 QIS offers a full range of machine management systems, from fully automatic to manual processes. For unique and custom processes, QIS provides personalized panels to streamline your operation. To ensure your industry stays ahead of the game, QIS offers a complete suite of maintenance packages. We have a limited supply of used PLC/SLC equipment for sale. Our business practices are as refined as the solutions we provide. Click here for information on our mission statement and philosophy.